If such a place actually exists, no doubt the soundtrack is Scott Bradlee’s Postmodern Jukebox. Founded by pianist and arranger Scott Bradlee in 2009, the ensemble reimagines contemporary pop, rock and R&B hits in the style of various yesteryears, from swing to doo-wop, ragtime to Motown – or, as Bradlee himself puts it, “pop music in a time machine.” The band parlayed a series of YouTube videos shot in Bradlee’s Queens living room into massive success, accruing more than 450 million YouTube views and over 2 million subscribers, an appearance on Good Morning America, and performances at packed houses across the globe. 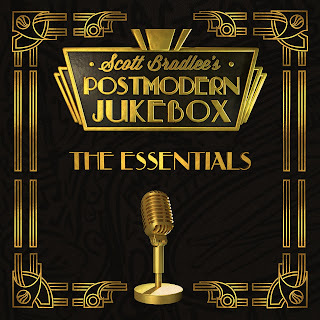 The Essentials, set for release on September 30 via Concord Records and Postmodern Jukebox Records, collects 18 favorites from Postmodern Jukebox’s weekly postings. Both the songs and the styles span decades – it just happens that the decades in question are separated by about half a century. Bradlee’s choice of material ranges from the ’80s hard rock of Guns N’ Roses to hits as recent as last year’s Justin Bieber plea “Sorry.” They’re rendered by a rotating cast of musicians and singers in fashions that date back to a time when Axl, Slash and Bieber’s parents had yet to be born – a time of street corner harmonies and torch singers, blues belters and golden-voiced crooners. If that hashtag denotes a modern-day mission statement, that’s no accident. 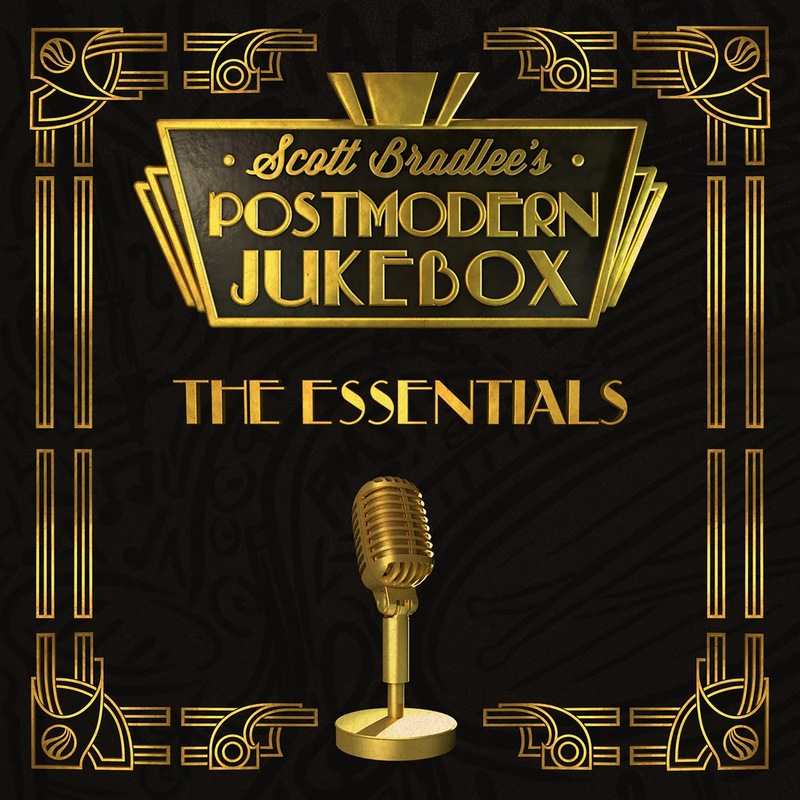 Bradlee conceived Postmodern Jukebox as a tonic for the auto-tuned vocals and programmed beats that populate today’s radio soundscape. Postmodern Jukebox combines a genuine appreciation for the melodies and songcraft of these recent hits with a passion for talented musicians playing real instruments. In its seven years of existence, Postmodern Jukebox has recorded literally hundreds of songs, but this release compiles the best of them, the tunes that Bradlee himself calls “most essential to the PMJ universe.” That includes the song that put the band on the map, a vaudevillian distressing of Macklemore & Ryan Lewis’ “Thrift Shop” fronted by Robyn Adele Anderson that garnered more than a million views within a week of being posted. The pin-up styled singer returned for the album’s opener, their ’50s doo-wop version of Miley Cyrus’ celebration of an inhibition-shedding spree “We Can’t Stop,” which garnered more than 19.5 million views and was named one of the “9 Best Viral Cover Videos of 2015” by People magazine. Maroon 5’s “Maps” flashes forward a couple of decades for a horn-laden ’70s soul sound featuring the powerhouse voice of Morgan James, while American Idol alum Haley Reinhart wrings the emotion from Radiohead’s breakthrough hit “Creep” as a torch singer worthy of Julie London. And while Meghan Trainor’s “All About That Bass” referred to the singer’s curves, Kate Davis takes it to another level with a smoking upright bass performance to augment a coy vocal redolent of Billie Holiday. Heavy metal and New Orleans jazz may seem to have little in common, but Bradlee finds the thread connecting the two, rendering both “Sweet Child O’ Mine” by Guns N’ Roses and the Darkness’ “I Believe in a Thing Called Love” as gutbucket Bourbon Street blues numbers featuring the stirring voices of Maiya Sykes and Miche Braden. Mykal Kilgore, meanwhile, rescues “My Heart Will Go On” from Titanic schmaltz to Jackie Wilson-style R&B. Similarly revelatory transformations mark every song on the album, which also includes favorites by Beyoncé, the White Stripes, OutKast and Lorde, who praised PMJ’s cover of her hit “Royals” as a favorite. That’s not even the most notable thing about the song, which is sung in the gorgeous baritone of Puddles, the “Sad Clown with the Golden Voice,” a performer in full face paint and ruffles that Bradlee describes as a cross between Andy Kaufman and Tom Jones.